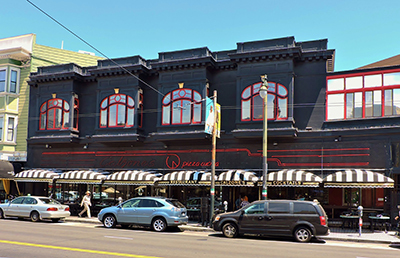 Calzone's Restaurant, San Francisco. Owner recovers our custom frame for an updated look. 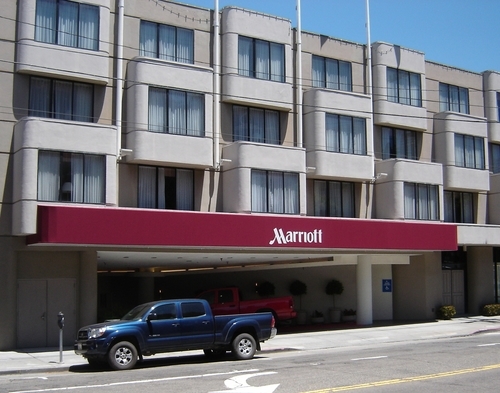 Horizontal, dome-style awnings with custom-welded stripes. Finished with black valance and gold-leaf stripes and lettering. 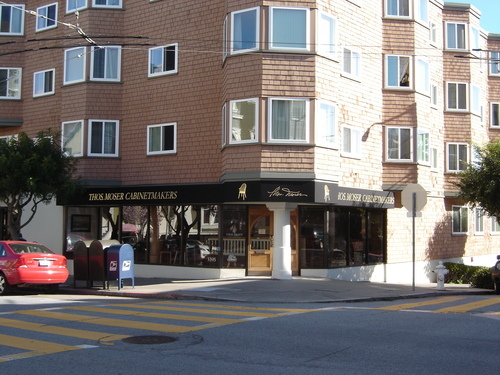 Mangiare Restaurant, San Francisco. 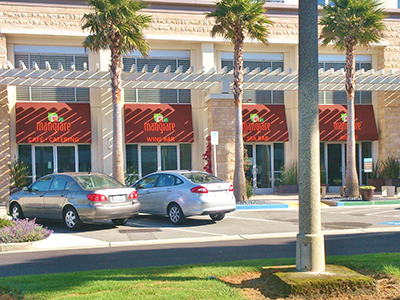 Traditional awnings on custom frame with multi-covered graphics. The Tower Market canopy was renovated with a new, stiffer sub frame and new awning fabric that glows at night from store lights. 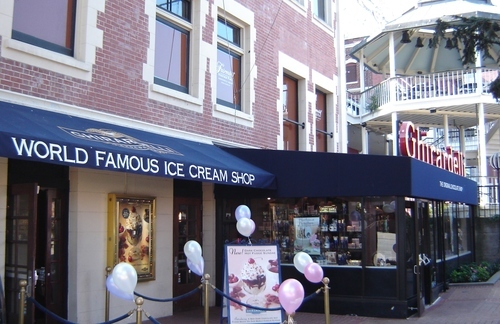 The awning has a main curve and corner, a curved top section, and a projecting entrance cover, all built within existing permits. There is a mesh ceiling panel that gives a clean finished look to the bottom. Translucent vinyl was fabric welded using the customer's graphics, then the canvas was cut out behind, so the name glows white and the logo glows red. 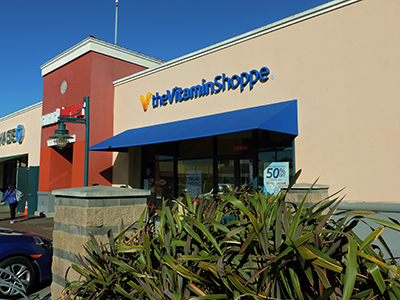 A white mesh ceiling panel from the front of the awning to the top edge of the store window opened the view from within, giving the store a more modern and open feeling. 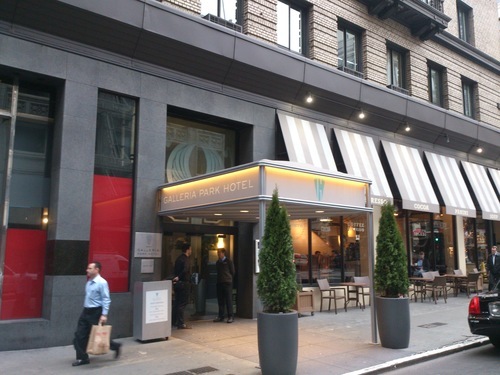 The ceiling panel conceals lighting fixtures designed to illuminate the awning and sidewalk. 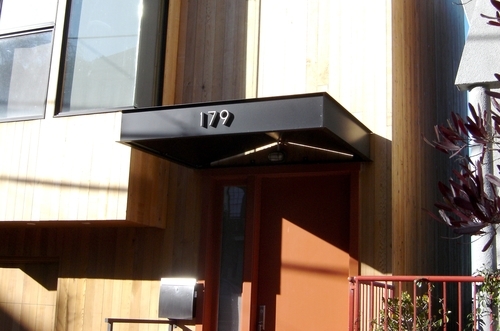 It provides a finished look from the sidewalk and conceals the repaired frame and the new, stiffer sub frame that gives equal support to both the top and main bows and the long curve around the corner of the building. 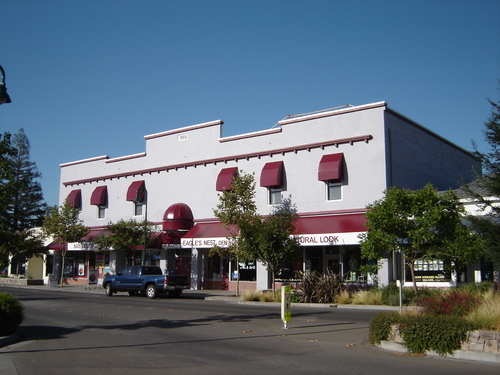 The awnings for Andronico's Market in Berkeley were designed to echo the traditional awnings in the neighborhood while expressing Andronico's strong design style. 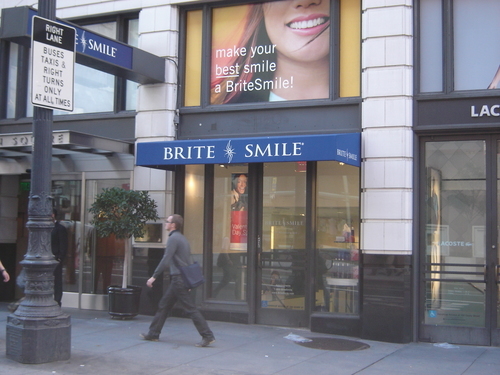 American Canvas worked closely with the store designers, creating an open sided fixed awning with a light and airy effect, balanced with larger 1.5 inch tubes on the support frames. The concept drawings provided for the city helped speed the approval process. Osso Steakhouse, San Francisco. 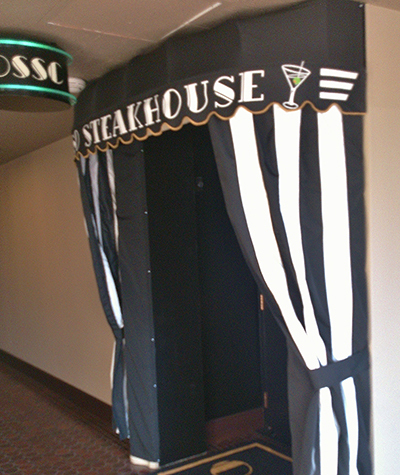 Interior entry makes a statement using custom awning and drapes. Commercial loading dock, San Francisco. 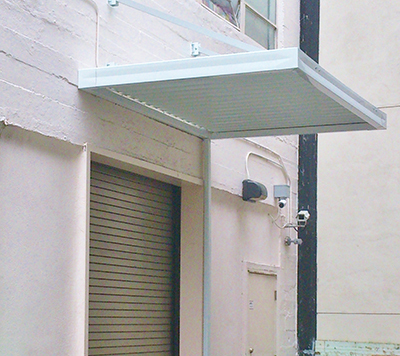 Pre-fabricated aluminum awning for covering loading dock. This is a small size but can be customized to fit up to 12’ projection and any width. 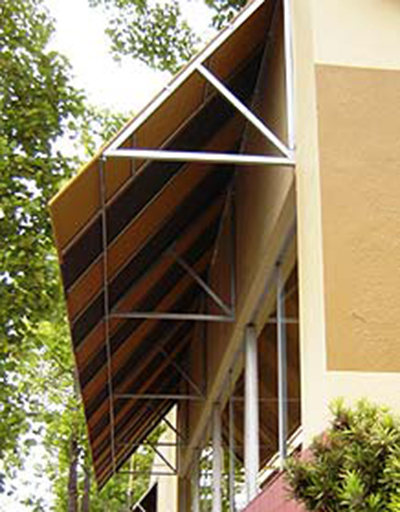 Traditional Sloped awning with open sides. Modified projection support to accommodate window height. Material sewn in full widths of alternating colors. Custom stripes can be welded with any color combination and widths. Flat top box awning with curved ends. Graphics are RF welded white translucent letters that are lit by interior lighting. Traditonal awning and extended sun room cover. Traditional awning with stencil painted graphics. 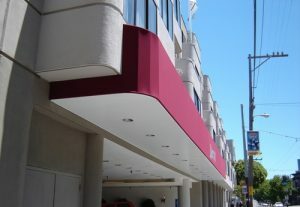 Curved Awning With Flat Face. Large span curved awning with complex curve. Flat face for maximum graphic area. 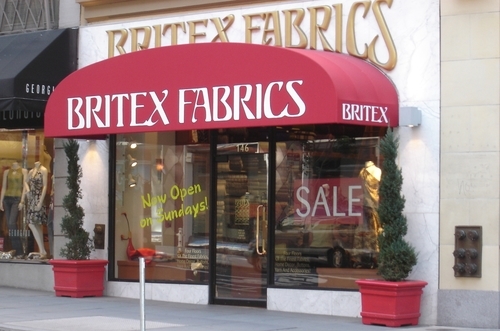 Box Awning With Standard Sloped Interior Ceiling. Standard box awning that follows contours of bay window above. Lettering is done with Gold Leaf for long lasting shine.